We are proud to represent the following manufacturers as each makes a quality fireplace and helps to give Maple Mtn Fireplace a good name. Each of these manufacturers makes a variety of fireplaces so you are sure to find something that will meet your needs and beautify your home. Convert any zero-clearance Valor gas fireplace to a beautiful outdoor unit with our Outdoor Conversion Kit and take advantage of Valor's radiant heat outdoors. Create a fun and functional living area for the whole family to enjoy, while producing an ambiance that only a live fire can provide. 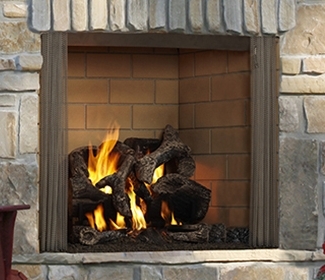 With our selection of gas and wood outdoor fireplaces you can even utilize two spaces at once. We have see-through fireplaces allow you to create both an indoor and outdoor focal point with the same unit.